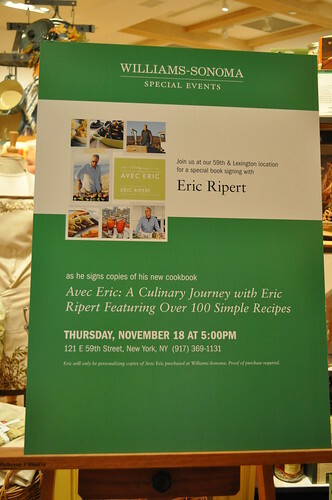 Marcus and I went to a book signing at Williams-Sonoma (at 59th and Lexington) for Eric Ripert and his new book, Avec Eric: A Culinary Journey with Eric Ripert. 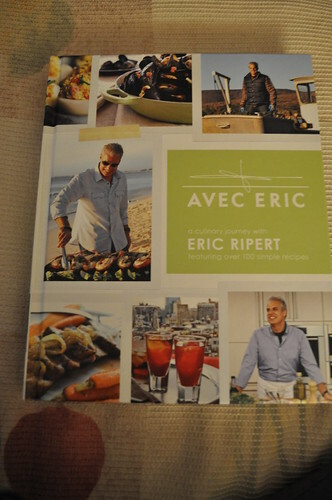 This new cookbook is based on his television program on PBC, Avec Eric, which centers around high-quality ingredients and simple cooking methods in a series of adventures to new places and meeting new people to cook food (both familiar and new) together. As I've mentioned before, Williams-Sonoma is known to give out samples they cooked in the store of a couple recipes from the cookbook being signed that day. They chose to make the salmon rillette (page 181), which uses smoked salmon and poached fresh salmon. It is served as an amuse-bouche at Chef Ripert's Manhattan flagship, Le Bernardin. 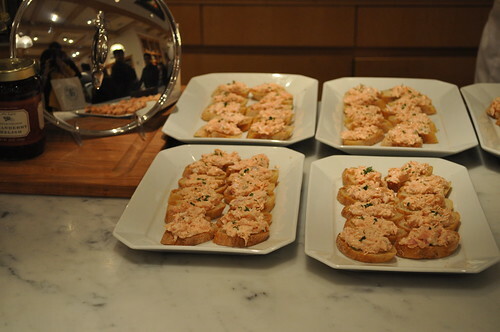 Here is the salmon rillette served on toasted baguette slices. It was very refreshing and would make for a great entertaining dish. 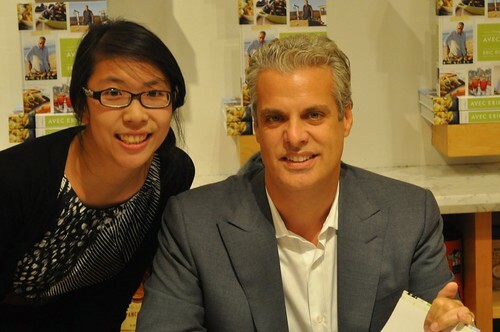 Me with Chef Ripert! He was a little shy at the signing, but it was lovely to meet him anyhow--very nice guy! 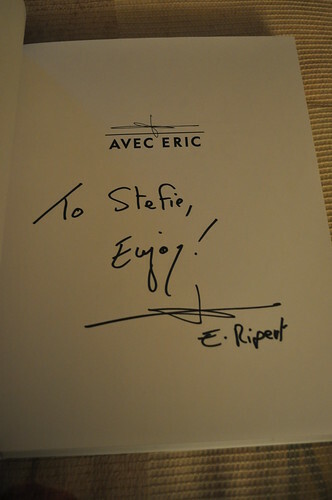 My copy of Avec Eric. Findings: As I've mentioned before, I'm a little (very much) obsessed with going to book signings. And to finally have met the famed "Fish Guy"--nothing can top that! 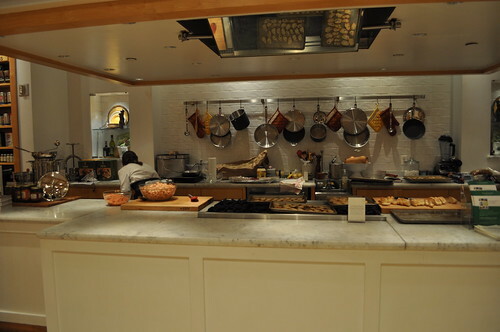 Now I have to make my way to Le Bernardin (currently holding the highest Zagat rating and three Michelin stars!) to see what the Fish Guy can do! I also need to start DVR-ing his television program on PBS ASAP--it's on its second season now. The recipes in here embrace the show's mantra of simple cooking methods with high quality ingredients--can't wait to test out some of these recipes! Anyhow, yay to adding another chef to my Beeline and John Hancocks collection on Flickr! Price point: $34.95 for each book. Is he as creepy looking in person as he is on tv? Haha, not at all! He's just really soft-spoken and a little bit on the shy side!